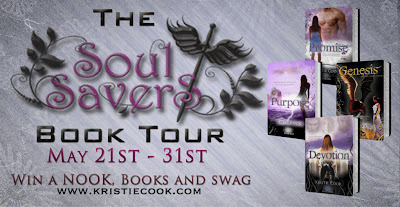 Good Choice Reading: Soul Savers Blog Tour: Guest post + giveaway with author Kristie Cook! Soul Savers Blog Tour: Guest post + giveaway with author Kristie Cook! Welcome to our stop on the Soul Savers blog tour. For our stop we have a guest post to share and an ebook giveaway of the third book in the series, Devotion! Plus, you can enter to win a NOOK SIMPLE TOUCH! Check it out below! QUESTION FOR RINA: What do you think 'devotion' to someone or something looks like? Rina: Devotion is always doing what is right by the person or thing to which you are devoted. Sometimes the choice is obvious, but others it is not. Sometimes we must choose between, how do you say, the lesser of two evils, no? Other times, we do what might appear as betrayal to others, but we know in our hearts it is the right choice. These are the difficult decisions, but we must stand strong and do what is right. O-M-G! Yes! You can enter to win a NOOK Simple Touch and more! Here on GCReading we are giving away a copy of Devotion. All you have to do is leave a comment below telling us what you think 'devotion' to someone or something looks like? Do you agree with Rina? Make sure to leave a way for us to contact you. It can be e-mail, Twitter, Facebook... anything! Visit http://www.kristiecook.com/2012/05/on-tour-and-you-could-win-nook.html for more details and to check out the previous and rest of the tour dates for more chances to win! This giveaway will end on the final day of the blog tour, May 31st. Good luck everyone! Thanks for being a Tour Stop for the Soul Savers series! Kristie is an amazing author. For people who have not read the books yet, they are seriously missing out. Thank you for the words of support! :) Glad you love the series. I haven't read any of this series yet. It does look good. Thank you for the blog tour otherwise I don't know if I'd have come across this one. I forgot to write my answer. I think devotion looks like the face of any mom. A mother can't help but be devoted to their young and there is a loving pride that shows on her face. This same look is on the face of devoted lovers too. Thanks, Victoria! I hope you get a chance to read it. Kristie Cook Series just Rocks!!! A unique story that hooked me from page one!!! You will laugh and cry. What a ride they are. Oh and devotion is when you are completely willing to do anything for someone regardless of the price. Rina is questionable but we will see as the story goes. Rina's answer is dead-on. It may be difficult when that devotion goes against someone you care about, but strength is needed to make it through the difficult times. Cool to see that you "get" her. As matriarch of an entire society and with a family of her own, she's in a tough position when it comes to loyalty and devotion. Devotion is being completly loyal to someone no matter what it takes including giving your life for theirs. Loving and supporing them in all they do and having unwavering trust! As for me, Devotion is staying true to yourself and your loved one (husband/wife) when things just don't go right. Seeing the good in the bad takes devotion and it's helped me. "When things just don't go right" - that's the true test, isn't it? Great answer. Good luck! Great answer from Rinas perspective! Thanks again kristie for the amazing series and many more to come! Damaris, thank you for being part of the tour! Everyone, best of luck with the giveaways! I hope you get a chance to check out the Soul Savers Series. I think Rina is absolutely right. I could not have put it better myself. I have definitely added Devotion to my tbr list. Thanks for the fabulous giveaway! Live it. Devotion to me is complete and total commitment and love. When I think of "Devotion", I think of Lady Gaga. She's so devoted to her craft that she lives and breathe every single piece of it. Even when her body is ready to shut down, her mind and heart combined pushes through the limits and continue performing. That, to me, is true Devotion. Great take. I honestly think all artists show the essence of devotion to their crafts. It's driven by passion. Love Rina's answer. She is so gentile and graceful. To me devotion is giving all of yourself, your body and soul. I've heard about the series but have not had a chance to read it yet. I love the paranormal/supernatural genre and would love to add your books to my home library. Devotion is staying true to your loved one despite the cost to yourself. Well said! I like this a lot. Devotion to me is always being there for that person without question. I'm excited to read this series. Thanks for the chance to win these great prizes. I think that all of the answers above sums up Devotion. To the people who said they haven't read this series; The Soul Savors Series is a must read! I'm anxious for the next book to come out this summer. Start reading; you'll find your as addicted as everyone else that has read it! Thanks Kristie! Thank you! I think you give excellent advice. Haha! BRAVO!!!! Yes. Service and sacrifice make the epitome of devotion. I do not have a fancy definition for devotion, but I would say it is putting someone/thing above yourself even if it means sacrifice. This series sounds really good. Thanks for the post and for the giveaway opportunity. I think you need to read just because there is a Sophia in it. Hehe I like your definition. Devotion is fidelity to me. Those looming faces on the cover are a little bit creepy! I do agree with Rina. I think Devotion is when you do what is in the best interest of a person despite any detriment to yourself. This sounds like a great series, I'd love to read it. Devotion to me is the extra mile my daughter goes to make sure my grandson with aspbergers gets all the care and education that he needs. Thanks for introducing me to a new author and series. I like her description of devotion. It's like with a pet, when their quality of life is gone, even though it tears you up, letting them go is better for them. Rina's description of devotion is perfect!! Devotion isn't always (probably never) the easy road!!! Totally love your books, your an amazing writer. I agree with Rina's description of devotion. Devotion is when you are loyal to something and it can be very hard. Thanks for the chance to win! devotion to me is when you stay with someone or something through everything, good or bad. also spend as much time with them or it when they need it. I have heard of this series and waited forever before reading the first book in which I was amazed by. I would love to own all the books. I agree with Rina, Devotion is the ultimate giving of yourself to someone/something. Of accepting that your by their side through thick and thin, to the end. Devotion to me is giving and believing in someone no matter anyone else says because you know that special someone will do the same for you. I love this series. With each book the story gets better and better. Can't wait for the next book to come out! What a delightful word! It's different applications sweetly intermix...feelings of strong or fervent affection and dedication and then religiously, a pious adoration and zeal! I love how Kristie interweaves this theme into Devotion :)! Devotion is having someone's back at all times. It's loving them even when they screw up, and admiring the person they are inside, no matter how they act sometimes. The book sounds fantastic! Thanks for the chance to win! Devotion is the lifelong dedication of family and friends to one another. No matter what happens. Of course I also believe this institution should be respected and betraying it over and over again can't be forgiven forever no matter how much you love them. Devotion is like a river, it needs to flow. Not be blocked by unending dishonesty. These books are very interesting. I hope to have a chance of winning. I think devotion is being loyal to someone and being there for them. But I don't think that just because you are devoted to someone that you can just do anything. You still need to stay true to your morals and values. Thanks so much, I would love to read some books by Kristie! Being devoted to someone gives you the ability to do things you might otherwise not have the strength to accomplish. I only just discovered this series the other day and voilà I stumble across this give-away. Thanks for hosting and really looking forward to the series. I haven't read the series yet, but would like to. Love the blog. Can't wait to read this. My definition would be sticking with someone or something always no matter what. It is loyalty and perseverance. Devotion to me is being loyal and trust worthy. Thx for sharing and I would love to read and review these books on my blog as well. I think devotion is putting that person first and I do agree that the best thing for someone isn't always what they want. Devotion, to me, is giving the person you're devoted to you loyalty above all else. I also agree with Rina's answer, even though it doesn't really match mine. I agree with Rina. Devotion to someone can mean making decisions that on the surface do not look like the right ones but truly are the correct answers...though it may not be realized at the time by all those involved. Make sense? It is doing what is right no matter how painful it may be.